Are you a contractor who needs millwork shop drawings? If yes, then I can help you. My name is Brian M. Curran. Since 2007 I've run my drafting service business in NYC. I have great People, a great Process, and a great Product. Let me explain a little about each. I two drafters who specialize in casework shop drawings. We know the woodwork industry. My senior millwork drafter has 15+ years of experience as a casework engineer. My second casework engineer has a few years of experience. To date we've completed a number of projects around the US, including bathrooms, cabinets, kitchens, libraries, media centers, reception desks, retail displays, stone facades and home theaters. Promptly answer your calls and emails, is reliable, is orderly, will give you realistic drawing delivery dates, has been around for years, has the experience you need, communicates well, and has more than one detailer so you're not left waiting in a long line. I can provide you with this level of service. We create architectural millwork shop drawings for commercial and residential projects. We know hardware specifications, appliances, material sizes, typical patterns (For instance - did you know that there are about 42,500 different options for raised panel doors. ), and etc. So the drawings my team creates for you will be correct, letting you complete your projects successfully. My team is finishing drawings weekly. If you visit the draftingservices.com Instagram profile, then you will see some current millwork drawing samples mixed amongst other completed projects. 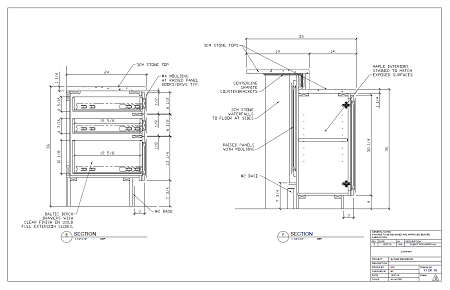 Here is a casework shop drawing sample in PDF format. The drawings were drafted in AutoCAD ®. Click image to launch PDF. As I said at the start, I have great People, a great Process, and a great Product. My drafting team would be a valuable asset to your business. Why don't you make your life easier by choosing to use draftingservices.com as your drafting service? Let me put my People, Process, and Product to work for you.